What makes some training programs successful while others produce disappointing results? The answer, says Ron Stone, lies in the processes trainers employ to determine needs, design and develop programs, deliver the training, and partner to get business results. It is time to reexamine these processes, says the author, and bring them into the twenty-first century. In Aligning Training for Results Stone provides a potent, comprehensive, and versatile resource to help guide trainers through assessing, designing, and delivering training solutions that achieve real and measurable results. Ron Drew Stone, an international consultant and presenter, is one of the world's most recognized and accomplished authorities on improving training and performance interventions and measuring results. He is president of the Center for Performance and ROI. He is also a partner with the ROI Institute, where he has helped to refine the ROI methodology. He works with businesses and governments around the world, providing performance consulting and workshops in linking training to business measures, designing training for results and ROI, conducting situational needs assessments, and evaluating results. 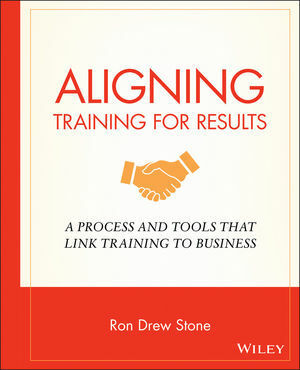 Ron also certifies practitioners in aligning training to achieve business results.